This verse wants to tell us that those who are foolish never discern others’ words, but blindly believe or obey every word they have heard. On the contrary, the intelligent and wise people are different. They handle others’ words with caution. If they do not understand, they can seek more instead of blindly following others or arbitrarily coming to conclusions. That reminds me when the Lord Jesus appeared to work, the Pharisees stubbornly held on to their own conceptions and imaginations and were against God. They spread various rumors slandering and condemning the Lord Jesus, and also incited and deceived the people into rejecting Him. Many Jewish people were deceived by their rumors and didn’t seek or study whether the Lord Jesus’ expression is the truth, the voice of God, and whether the Lord Jesus is God Himself. Instead, they blindly listened to the Pharisees’ devilish words, rejected the way of repentance preached by the Lord Jesus, ultimately followed the Pharisees in resisting God, and forever lost God’s salvation. By contrast, regardless of how many rumors and nonsense the Pharisees spread, those who truly followed God were cautious toward the Pharisees’ words. 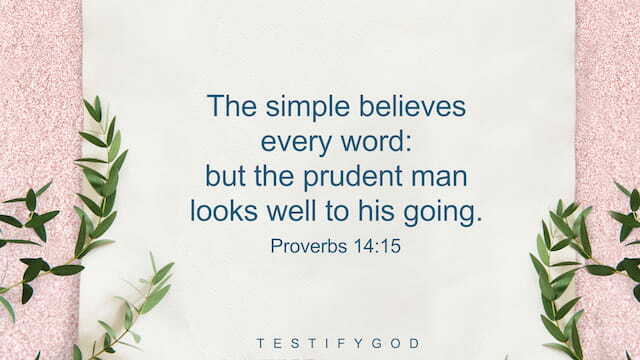 They neither blindly believed the Pharisees nor were deceived by their rumors, but carefully listened to God’s words and actively sought the true way. Eventually, they, convinced that the Lord Jesus is God Himself, resolutely followed God, and received His great salvation. From this, we can see that when God’s new work comes upon us, we may hear someone yell “Behold, the bridegroom comes; go you out to meet him,” we may also hear someone fabricate rumors discrediting God’s work as the Pharisees did. So, in matters that we do not completely understand, we must be cautious, focus on seeking the truth and studying the true way and listening to God’s voice. This is wise and prudent men. If we hear someone testify “the bridegroom comes,” we neither seek nor study but blindly listen to rumors and falsities spread by others. This is our folly. Then in the end we are the ones who will suffer a loss. » You may be interested in reading more on our Second Coming of Jesus Christ page, or in the articles below. Proverbs 3:5-6 Trust in the LORD with all your heart; and lean not to your own understanding. In all your ways acknowledge him, and he shall direct your paths. Reflection This scripture teaches us that we should rely on God in whatever we do. However, we often go in the wrong direction and rely on our own intelligence and ability. In the process, things may eventually be done and problems may be solved, but our spiritual life didn’t make any progress. We missed the opportunity to know God and the experience to establish true faith in God. God’s words say, “If you don’t learn how to look to God and rely on God, you will never see the work God does on you, or the guidance and enlightenment He gives to you. If you can’t see these things, then the matter of whether or not God exists, whether or not He guides everything in the life of mankind will, in the depths of your heart, end with a question mark and not with a period or exclamation mark. ‘Does God guide everything in the life of mankind?’ ‘Does God observe the depths of man’s heart?’ This will be troublesome. For what reason do you make this a question and add a question mark? If you do not truly rely on God or look to Him, you will not be able to generate a true belief in God. If you can’t generate a true belief in God, then the question marks will forever be there with everything God does, and there will be no periods.” » You may be interested in reading more: • How to Overcome Exam Anxiety? Learn to Rely on God • Relying on God, I Got More Than a Job • Relying on God, I Easily Modify Well Creative Proposal Peace be with you all! Dear brothers and sisters, if you have any understanding or enlightenment from God, you’re welcome to share with us.1. Via the online chat window at the bottom right corner of the screen.2. Send an email to info@testifygod.org.We sincerely hope we’ll grow spiritually through sharing with each other. Matthew 16:22 “But he turned, and said to Peter, Get you behind me, Satan: you are an offense to me: for you mind not the things that be of God, but those that be of men.” Reflection When the Lord Jesus predicted to His disciples His own death and resurrection, Peter relied upon his kindness and dissuaded Him from going to the cross. In our view, Peter didn’t want the Lord Jesus to be crucified out of kindness. But how did Lord Jesus view this? God’s words say, “When the Lord Jesus was about to be crucified, what did Peter say? (‘Be it far from you, Lord: this shall not be to you’ (Mat 16: 22).) Did Peter have the true belief when he said these things? (No.) What is this called? This is man’s good intention, and this is called interrupting. Where did his good intention come from? (His own will.) Why was he able to manifest this kind of self-will? He had a point of view. What point of view? He didn’t understand God’s will, didn’t understand what ministry the Lord Jesus had come to do. His understanding of the Lord Jesus was limited to a kind of good intention and protection. It was ‘a little bit of affection’ and ‘a little bit of protection’ that people would say, which was, ‘This absolutely cannot befall You! You must not go to suffer that pain! If someone has to suffer it then let me suffer it. I will suffer it in Your place.’ He didn’t know God’s will, and he came up with some good intention from his own will, wishing to prevent this event from happening. So how can we describe his way of doing things? What brought it about? Firstly, it was brought about by his hot blood, his will and his not understanding. Secondly, did he have a true belief in God? (No.) If he didn’t have the true belief in God, how could he have this good intention? Did his good intention come from the truth? Was it a kind of good deed? (No.) Then at the very least he was good-willed, and he was well-intentioned and he showed his sincerity, right? (Yes.) So what was the nature of his way of doing things? Was it a kind of behavior, a way of doing things that arose from the true belief? (No.) You see it clearly now; it absolutely wasn’t. Was it a kind of conviction? What is a conviction? Discuss about it using this matter—what is meant by ‘conviction’? (It means ideas that come from man himself.) (Conceptual things.) It is one’s own concepts, imagination and will. It is having a kind of good yearning, good desires; it is the things that people think of as good, positive and active, it is something that is to people’s taste, that conforms to people’s concepts and to people’s sentiments; it is a kind of good will, a kind of good thinking, a good way of doing things, a kind of good motivation—this is what is meant by ‘conviction.’ It is not the true belief; this is 100 percent certain.” From God’s words we can see those who don’t have true faith in God rely on their own will and good intentions to do things. And thus they can easily be Satan’s outlet interrupting and disturbing the work of God. God’s work is done by Himself and is unfathomable to man. Whether crucifixion comes upon the Lord Jesus is determined by the Lord: The Lord allows it to happen then it happens; the Lord doesn’t allow it to happen then it shall not happen. The occurrence, development and outcome of all the people, things and events are determined by God, not by man. Peace be with you all! Dear brothers and sisters, if you have any understanding or enlightenment from God, you’re welcome to share with us.1. Via the online chat window at the bottom right corner of the screen.2. Send an email to info@testifygod.org.We sincerely hope we’ll grow spiritually through sharing with each other.